I can’t have enough number mats in my math cabinet. Numbers mats are simple for learners to use, perfect for thematic units and review number sense in one page. 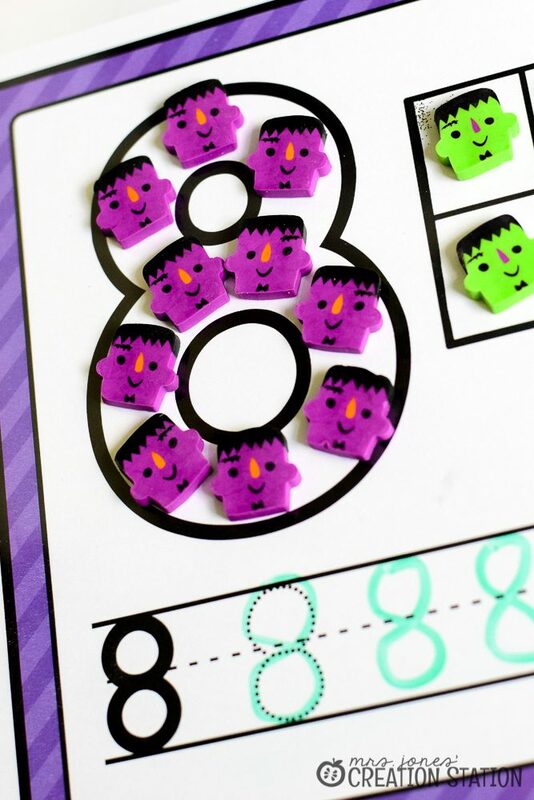 These free Halloween math mats are perfect for some spooky learning. Number mats are a resource that I have on hand for math centers and lessons. 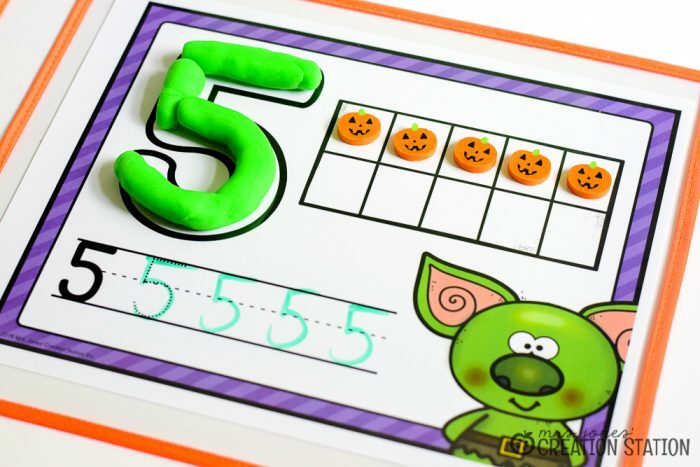 Number mats usually include a numeral forming, writing, and counting portion. Having all these components on one page allow learners to get the most out of their time. Using number mats might be a little bit more work in the beginning. But having some essential materials on hand help it to work much smoother. I like to have mats in our math stations and in my guided math resources. Number sense is such a huge part of our math instruction. And having resources learners are familiar with available through our math block is the best fit. So when it comes to prepping these mats, I do a little lamination and a little pocket action. Laminated number mats are the easier way for my learners to reuse them during stations. But, having them in a pocket gives me the opportunity to pull out different materials. 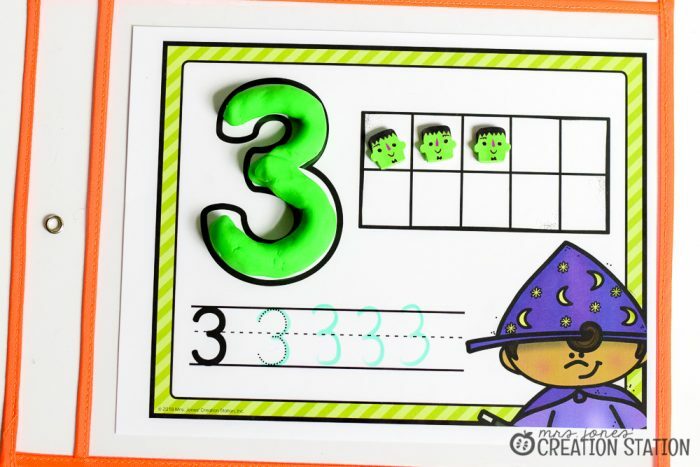 Need some more numeral writing practice, replace the mat with a numeral writing page. Simple and easy! It is probably no surprise that I have too many Halloween math materials. I love to have these available for my learners to use during our thematic unit. The numeral formation is so fun for my learners. 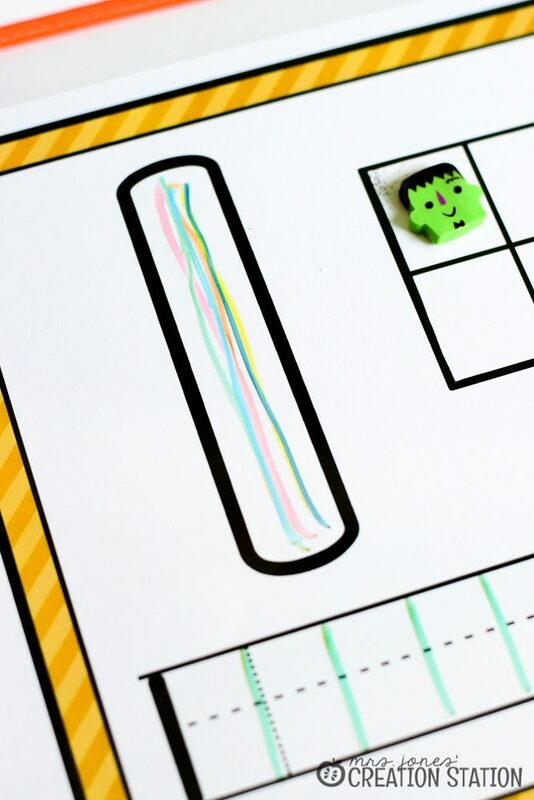 Having different materials available for this activity helps to keep them excited about their learners. Some of my favorite materials include playdough , mini-erasers , snacks, and markers. During small groups, I like to have learners practice their number formation off the mat, too. This allows learners to become more independent. Don’t underestimate the power of simple. You don’t need a stash to make number mats work for your learners. All you need is a dry-erase marker . 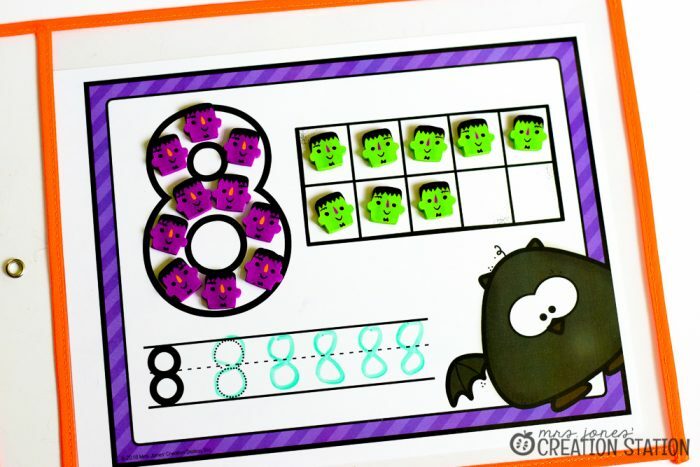 Have learners rainbow write the numeral, write the numeral on the lines and color the correct amount on the ten frames. You can grab these number mats by clicking on the MJCS download image at the bottom of this post and waiting to be redirected in your internet browser. 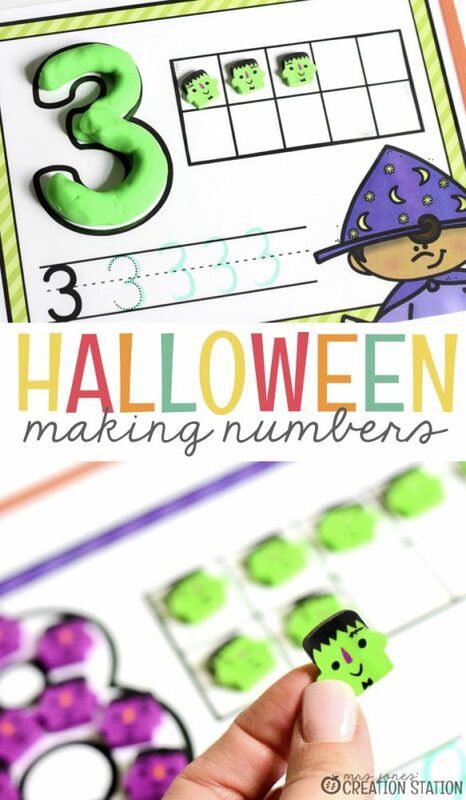 Want More Halloween Learning Ideas? 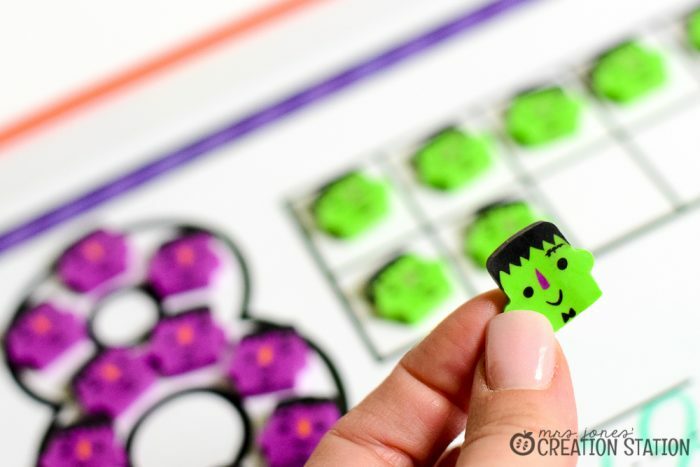 Add STEAM Halloween lessons to your week of spook-tacular fun. Find the perfect Halloween books to add to your classroom library. 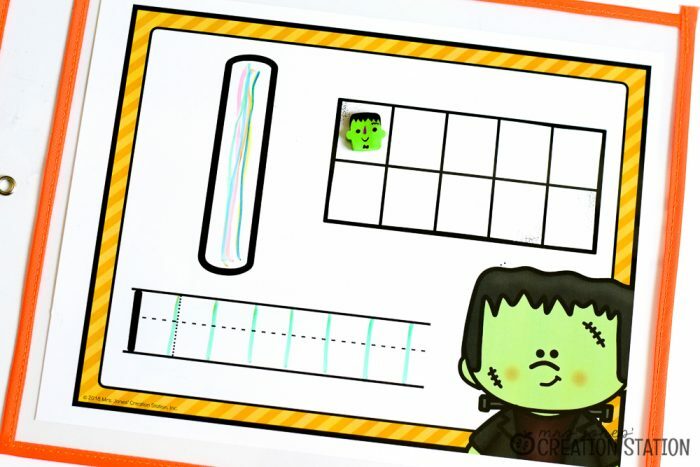 Help your readers with their word fluency using this Halloween literacy center.